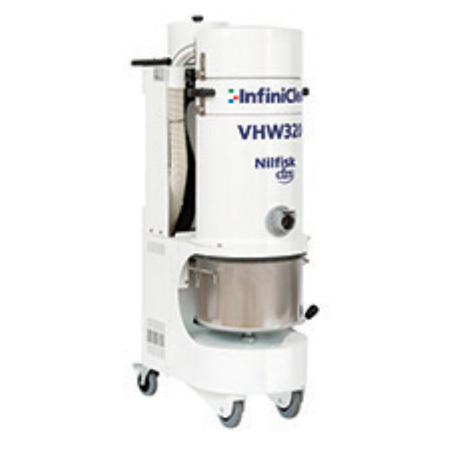 Clogged filters directly impact vacuum performance and cause costly downtime, so Nilfisk CFM designed InfiniClean to continuously clean the filter during unattended, continuous-duty or extremely dusty applications. InfiniClean is a self-contained, automated filter purging system requiring no external compressed air supply, secondary power source or interference by the operator. Available on the following models: VHW320 IC, VHW420 IC, VHW440 IC and VHT446 IC. Waterlift, controlled 88" 76" 92.3"
Dimensions (L x W x H) 28.9" x 17.3" x 53.9"
38.2" x 21.3" x 61.4"
44.5" x 23.6" x 60.2"
For more details and information, please refer to the product brochure.